On March 25, the Michigan Senate narrowly approved its first proposal for a fiscal year 2009 budget to fund the state's Department of Community Health. As passed that day, Senate Bill 1094 would have appropriated just under $12.5 billion. This was $2 million less than what the governor requested and $434 million more than what was budgeted for public health in fiscal 2008. It could have been higher. During consideration of the bill, Senate Democrats requested seven amendments that totaled more than $90.5 million worth of additional spending. Each was narrowly defeated, despite receiving unanimous approval from the minority Democratic caucus, with five amendments receiving one Republican vote each. Two Republican senators voted in favor of least $36 million from this proposed extra spending. "I would just point out that this budget shows an increase [of $434] million, almost a half-[billion] dollars over the current budget. It is rising f5rom $12 billion to nearly $12.5 billion, and yet, it is never enough." Sen. Nancy Cassis, R-Novi, asserted that those who voted for the amendments were endorsing a "spending spree" and asked whether they would "dare to increase taxes" again as a means of paying for their spending increases. After the spending amendments failed, every Democratic senator but one voted against sending the Senate draft of the public health budget to the House of Representatives. Sen. Martha Scott, D-Detroit, explained that "there are some amendments that we did not pass today that I think are very, very important." She added that "until we get a real grasp on who it is we need to be taking care of, then I will continue to vote ‘no' on these kinds of bills." On May 16, the official state tax revenue estimate for fiscal 2009 was downgraded, with the new analysis projecting $393 million less than had been anticipated in January 2008. Nonetheless on July 17, the Legislature and the governor agreed to a 2009 funding level of $12.5 billion for the Department of Community Health. This is $485 million above the amount appropriated for fiscal 2008 and the largest budget of its kind in state history. 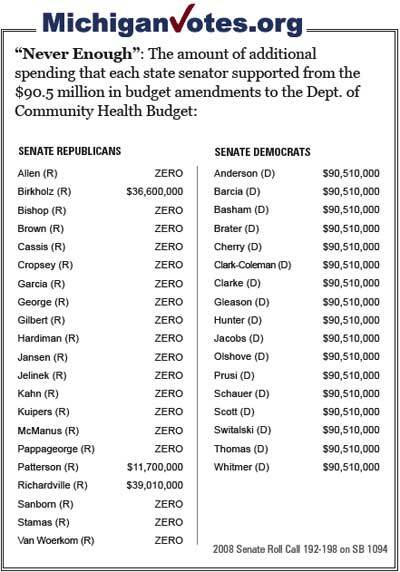 The amount of additional public health spending that each state senator supported among the $90.5 million in budget amendments is displayed in the table below. For additional information and an opportunity to comment on this issue, please see www.mackinac.org/9615.